Once, in the Ancient Times of board games (about 10 years ago), from the exotic lands of Germany, a game called Agricola was made. It was about farming, and also about misery and existential dread. Agricola is a masterpiece for many reasons, and it showed a large number of gamers the simple pleasure of farming as a board game theme. 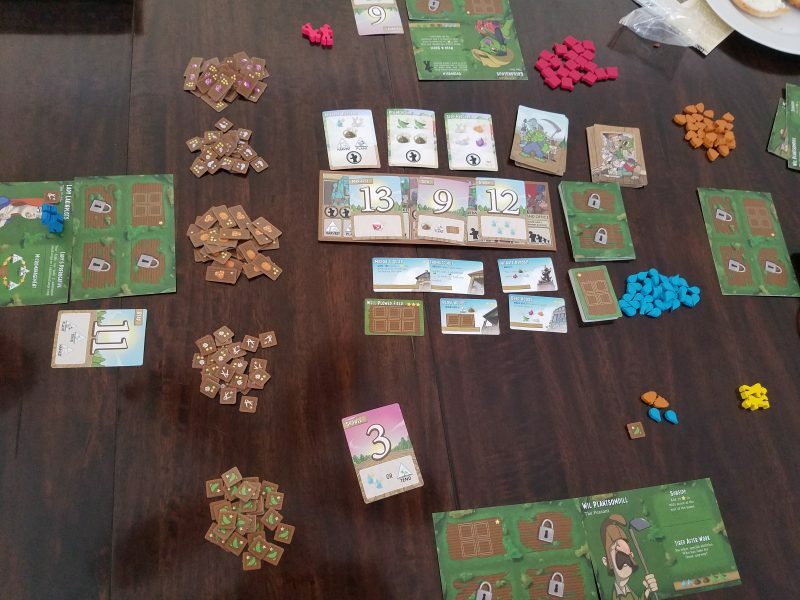 In hindsight it’s not hard to understand why farming works for board games. From a very broad and imprecise perspective, the difference between Euro-centric design and American design with modern gaming is that the former is focused on the players constructing, while the latter is about destruction. In Catan you’re building up your roads and cities and villages. In Risk you’re trying to destroy the other players. Farming is all about growth, on both micro and macro levels. Obviously you’re growing plants from seed to maturity, but you’re also trying to build up your infrastructure and expand your enterprise. It’s largely granular–crops are either able to be sold/consumed or not. A plot of land is utilized or not. Animals either breed or not. And farming is also deliberately and simply paced. Good practices result in good results which result in more opportunities to expand. All of these aspects are part of Euro design, so it makes sense that the theme fits like a well-used glove. 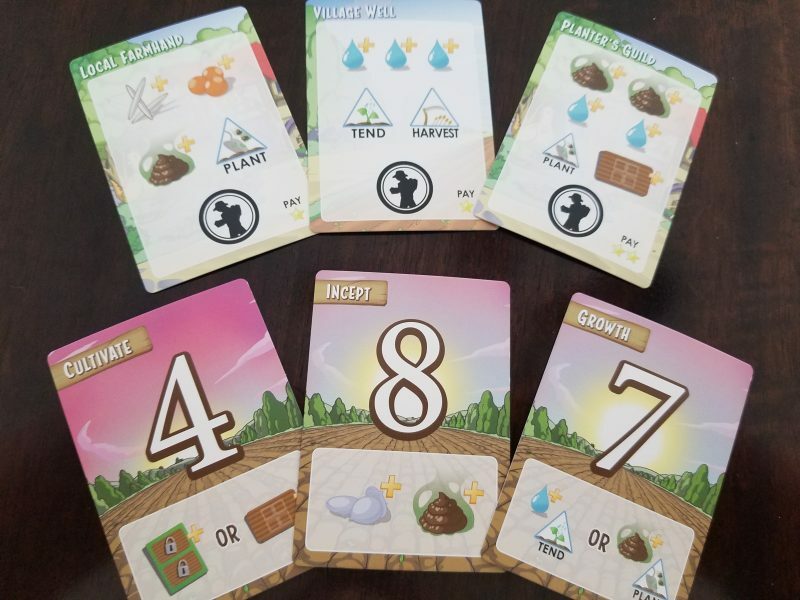 All of that to say that Harvest, designed by Trey Chambers and published by Tasty Minstrel Games, is another farming Eurogame that uses the theme (with a bit of a fantasy twist) wonderfully to create a quick and fun experience with a wide strategic scope. It’s a worker placement game shrunk down to only 10 actions per player, which surprisingly doesn’t feel like too few, but just barely (some may disagree). And it replaces Agricola’s anguish and malaise with tiny wooden turds. You’re going to be growing various plants and expanding the size of your farm, but mostly you’re going to try to utilize your special character abilities and buildings to try to squeeze more victory points out of everything you do. The special sauce here is the collection of player characters, which provide truly unique and interesting abilities that force you to rethink everything you previously thought about the game. Alternatively you could flip over your player board and play with the standard non-special character named Boring McBoreson or something who gets no abilities except a 15 point handicap, but then you’d be officially No Fun, and no one wants that to happen. There’s a good number of characters and some of them are plain weird, like a troll that gets negative points for having fields, which is kind of the point of the game, or a woman who can put fields and buildings anywhere without acquiring any space to put them on. You simply pile them up around you like you’re too cool for traditional notions of property, yo. Others simply make standard actions, like planting or tending, more efficient. See, the buildings are really cool because there’s a public selection of them up for grabs, and they split between passive abilities that help you do things you’re going to be doing anyways, and end game scoring bonuses. Normally this might be a problem because if there are only a couple of passive abilities available early, the people who gobble them up might have an annoying leg up. But Harvest sidesteps this issue for two reasons. First, the game is only 10 actions so the early game is, for all intents and purposes, also the end game. There’s no bifurcation there at all. It’s just “the game” and it’s a mad rush to get points now while building some kind of engine (or not, if your character abilities nudge you elsewhere) at the same time. Second, the very clever initiative system means that, if you really want to go early in the turn order, you probably have the opportunity to do so. It’ll just cost you. Everyone gets a random initiative card at the beginning of the game. Each of these cards has a number and some kind of bonus on it–resources and actions. Better initiative numbers let you take your turn sooner in the following round, but the later initiative cards have better bonuses attached to them. Before each round you deal 3 new initiative cards out, and in turn order people swap their current card for a new one. This keeps the turn order fluid and it provides another layer of choices within the game. It forces you to read your opponents and try to predict what actions they’ll want to take the following round. It makes you plan out your actions not only in the context of what you want to do, but in the context of what you may or may not be able to do given the turn order and resources gained. Finally, the initiative system distributes more resources to the players, which simply feels good. Even though it’s part of the game just like the standard actions, getting new seeds or wooden turd tokens in the initiative phase somehow feels better, like a bonus. Speaking of bonuses, on top of the standard actions, which I promise I’ll get to talking about soon, each round contains a display of randomly selected actions. They’re strictly better than the standard actions from a resource-counting perspective, but they may not have what you actually need that round. Do you shift your strategy to follow the whims of the action deck, or do you perhaps go for a later initiative card that has something you really want, knowing that the other players will probably fight over the more valuable actions, leaving you free to take standard actions you want at the end of the turn order? These kinds of thoughts are called interesting decisions, and they are the heart and soul of a good board game. The standard actions available every turn are dull in comparison. You can get two resources (seeds, turds, water, etc). You can expand your farm by opening up more land and putting a field or building on it. You can go through the motions of actually farming by planting (paying with turds), tending (which costs water and effectively reproduces your plants), and harvesting (which clears your fields). Standard fare, but necessary. Back to more exciting parts. Have I mentioned the currency? It’s points! Okay, that’s not so exciting–many games do that. But in Harvest, points that you can actually spend to buy things (like all-important buildings) are harvested plants. You need to get some plants grown before you can spend money to better make your plants grow. And if you try to splurge on expensive plants from the start, you’d better be careful because you can’t make change. I learned that the hard way. It’s a fun little chicken and egg problem built into the currency system of the game. Somehow after writing about all of these fun bits to the game I still have to remind myself that Harvest is only a 30-45 minute experience. Somehow it feels more grand when you think back to it, while somehow also feeling tight and difficult while playing it. I don’t know how that works, but Harvest managed to pull it off. Some of the player characters seems a lot more difficult to grasp than others, which may frustrate new players a bit. But I also don’t care, because each time I pull out Harvest it’s like learning how to play the game well all over again. I have to figure out how to utilize my character abilities. I have to examine the building market and see what strategic opportunities might await me. And I have to adapt to the new information I get from initiative cards and action cards each round. There’s a nice blend of strategic and tactical thinking that I like. And if you get a character you can’t wrap your head around, or if the random card draws don’t go your way, it’s still fun to try to maximize points and start a new game in a quick half hour. That’s not to say that Harvest manages to be as interesting as its more robust (and longer) Euro counterparts. When I talk about all of these mechanisms that work well and provide interesting decisions, I mean that they’re lightly interesting. They make you think, but not necessarily too hard. I’m sure that there is a level of planning and mastery to be gained in Harvest through dedicated play, but the randomizing elements put a soft ceiling on it. As a reviewer this puts me in a sort of dilemma. How do I rate a game that succeeds with modest goals? Do I give it an amazing score because it’s accomplished what it set out to do? Or does it necessarily limit its rating due to its very nature? The latter doesn’t seem fair to the game, but the former doesn’t seem fair to other games that succeeded at something more ambitious. As always I default to my overall experience. How much fun do I have playing Harvest? The answer is a good amount, consistently. It doesn’t blow my mind, but so far it hasn’t disappointed at all. Perfectly executed french fries are never going to be as good as the perfect steak sitting next to them, but they’re a delight regardless. Harvest is a joyful respite from heavier Euro brain-burners. It doesn’t try to be innovative (everything here you’ve seen before, with some slight variation), and it doesn’t try to be the deepest experience. 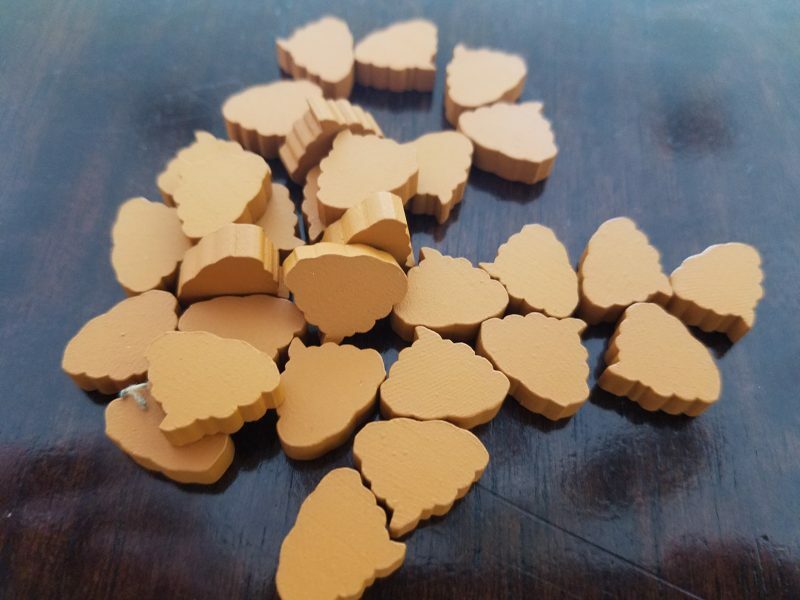 It’s trying to be a small, inexpensive, short game with a lot of variety, interesting decisions, and tiny wooden turds. To that end, it unequivocally succeeds.